The incredibly lightweight Adamson M12 monitor delivers everything you need in a low profile stage monitor: fantastic gain before feedback, precise pattern control and high output with extremely low distortion. Together, the symmetrical trapezoid design and the 65° x 65° waveguide, allow any two M12s to operate as a mirrored pair. The M12 exhibits remarkably low distortion thanks to the qualities of its advanced multi-layer Kevlar cone driver. Adamson’s first lightweight, long-excursion 12” Kevlar Neodymium driver supplies exceptional power handling with outstanding mid-frequency response, ideal for demanding vocal performances. Adamson’s Advanced Cone Architecture dramatically increases the linearized mid-range response by reducing the radial and chaotic modes in the ND12-L’s passband. 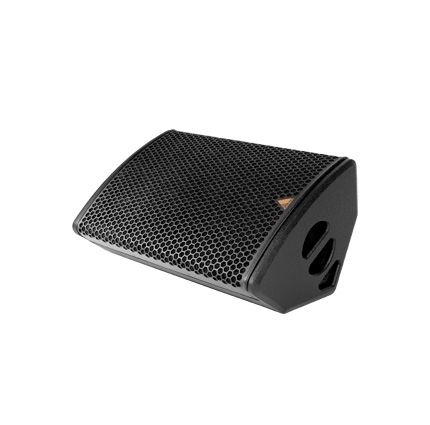 The Kevlar cone design also enforces extreme durability in wet conditions making the M12 an ideal solution for outdoor events. The M12 is available in Active (Bi-amped), or Active / Passive switchable configurations.